enables and performs program decision making, establishes practices to support the program, and maintain program oversight. comprises the framework, functions, and processes by which a program is monitored, managed, and supported in order to meet organizational strategic and operational goals. has management responsibilities to ensure that the program is run within the governance framework while managing the day-to-day program activities. should ensure that the program team understands and abides by the governance procedures and the underlying governance principles. It is the governance of the different components of a program, that is achieved through the actions of the program manager and the program team. Program governance is impacted by organizational governance, which is a structured way to provide control, direction, and coordination through people, policies, and processes to meet organizational strategic and operational. Ensuring that the goals of the program remain aligned with the strategic vision, operational capabilities, and resource commitments of the sponsoring organization. Making decisions to transition between phases, terminate, or close the program. To facilitate the design and implementation of effective governance, many organizations prepare documented descriptions of each program’s governance frameworks, functions, and processes. The purpose of the program governance plan is to describe the systems and methods to be used to monitor, manage, and support a given program, and the responsibilities of specific roles for ensuring the timely and effective use of those systems and methods. The program governance plan may be modified as appropriate, based on outcomes attained during the course of the program. It is generally accepted good practice to ensure that modifications are effectively communicated to those stakeholders responsible for program governance and program management. defines roles and responsibilities: who will have accountability and authority with respect to key decision-making categories and responsibility boundaries. contain a schedule of anticipated program-related governance meetings, activities, and key milestones, such as scheduled expected decision point reviews (including phase gate reviews), program health checks, and required audits. Dependencies, assumptions, and constraints. List of governance key dependencies, assumptions, and constraints including resource, budget, and operational limitations. Benefits, performance metrics, and measurement. List of the methods and metrics used to evaluate the program and evaluate component contributions to benefits, and a description of how information on the components will be collected, consolidated, and reported (e.g., a balanced scorecard or dashboard). Support services. Identification of the areas where governance-related support is needed. Included is a description of the feedback and support approach used during the program. Stakeholder engagement . A listing of the stakeholders who should be engaged and communicated with during the program’s life cycle and governance activities. The vision and goals of the organization provide the basis for strategic mandates that drive the definition of most programs. Program governance ensures that any program within its area of authority defines its vision and goals in order to effectively support those of the organization. Program business case. Serves as a formal projection of the benefits that the program is expected to deliver and a justification for the resources that will be expended to deliver it. Program charter . Authorizes the program management team to use organizational resources to pursue the program and links the program to its business case and the organization’s strategic priorities. Program governance facilitates program funding to the degree necessary to support the approved business case. When program funding needs to be secured from external sources, program governance is typically responsible for entering into the appropriate agreements necessary to secure it. describes the definition of success consistent with the expectations and needs of key program stakeholders, and reinforce the program alignment to deliver the maximum attainable benefits. Program funding and financial performance. Effective risk and issue management practices ensure that key risks and issues are escalated appropriately and resolved in a timely manner. (b) outside the program, between the program management team, the program’s steering committee, and other stakeholders. Based on the risk appetite of the organization, and working with organizational governance and the program management team, program governance may establish program risk thresholds for adherence within the program. Quality management planning is often performed at the component level, and therefore is managed at that level. The governance participants are responsible for reviewing and approving the approach to quality management and the standards by which quality will be measured. Roles and responsibilities for required program-level quality assurance and quality control activities. The program manager assesses whether the risks associated with potential changes are acceptable or desirable, whether the proposed changes are operationally feasible and organizationally supportable, and whether the changes are significant enough to require approval of the program steering committee. The extent to which a change can be authorized by program governance is bounded by the program business case and organizational strategy. Fulfillment of criteria for exiting the preceding phase and entering the succeeding phase. The importance and use of these reviews increase when there is an extended period between scheduled decision-point reviews. The program governance plan specifies governance requirements for the scheduling, the content, the participants, and the assessments (or metrics) to be used during such health checks. (b) the firm commitment of organizational resources for its completion. The program manager frequently acts as the proposer when seeking authorization for the initiation of these components. Authorizing the governance structure to track the component’s progress against its goals. Confirming that all other accepted practices for project or program transition or closure have been satisfied. The program steering committee reviews and makes decisions on recommendations for the closure of programs. Alternatively, programs may be terminated because changes in the organizational strategy or environment have resulted in diminished program benefits or needs. Regardless of the cause for termination, closure procedures should be implemented. The final program report is approved by the governance participants during closure. Establishing an appropriate collaborative relationship between individuals responsible for program governance and program management is critical to the success of programs in delivering the benefits desired by the organization. Program managers rely on the program steering committee (also referred to as the program governance board , oversight committee, or board of directors) members to establish organizational conditions that enable the effective pursuit of programs and to resolve issues that inevitably arise when the needs of their program conflict with the needs of other programs, projects, or ongoing operational activities. In accordance with the program charter, program managers assume responsibility and accountability for effectively managing programs in the pursuit of organizational goals as authorized by the program steering committee. Program sponsor. An individual or a group that provides resources and support for the program and is accountable for enabling success. Program steering committee . A group of participants representing various program-related interests with the purpose of supporting the program under its authority by providing guidance, endorsements, and approvals through the governance practices. Program management office (PMO). A management structure that standardizes the program-related governance processes and facilitates the sharing of resources, methodologies, tools, and techniques. Program manager. The individual within an agency, organization, or corporation who maintains responsibility for the leadership, conduct, and performance of a program. In the context of governance, this role interfaces with the program steering committee and sponsor and manages the program to ensure delivery of the intended benefits. Project manager . The person assigned by the performing organization to lead the team that is responsible for achieving project objectives. In the context of governance, this role interfaces with the program manager and program sponsor and manages the delivery of the project’s product, service, or result. Other stakeholders. These stakeholders include the manager of the portfolio of which the program is a component and operational managers receiving the capabilities delivered by the program. The program sponsor is the individual responsible for committing the application of organizational resources to the program and for program success. Remove barriers and obstacles to program success. Program steering committees ensure that programs are pursued in an environment with appropriate organizational knowledge and expertise, well supported by cohesive policies and processes, and empowered by their access to those with decision-making authority. Approve program closure or termination. It facilitates the governance practices. It is a management structure that standardizes the program-related governance processes and facilitates the sharing of resources, methodologies, tools, and techniques. It provides professional expertise using staff highly trained in applying program governance practices to provide oversight, support, and decision-making capability to the program. The PMO role may extend to monitoring compliance to program management practices. The program manager is the individual responsible for management and oversight of the program’s interactions with the program governance function. Manage, monitor, and track overall program benefits realization. In the context of a program, the project manager role generally refers to an individual responsible for oversight or management of a project that is being pursued as a component of the program. Several other stakeholders may have program governance related roles. The portfolio manager may have a role in ensuring that a program is selected, prioritized, and staffed according to the organization’s plan for realizing desired benefits. The operational manager is generally responsible for receiving and integrating the capabilities delivered by other program components for achieving desired organizational benefits. This role has governance implications as it informs and performs the governance practices. Program governance begins with (1) the identification of governance participants and the (2) establishment of governance practices. There is also the need to (3) define expectations for how governance-related roles are filled and responsibilities are discharged. Governance practices may differ depending on the sector or industry that the organization serves. Governance of programs in such diverse fields as national or local government, aerospace and defense, banking and financing, and pharmaceutical development may have remarkably different needs based on the unique political, regulatory, legal, technical, and competitive environments in which they operate. Governance practices provide the foundation for ensuring that decisions are made rationally and with appropriate justification, and that the responsibilities and accountabilities are clearly defined and applied. Legislative environment . Programs that are significantly influenced by changing legislation may benefit from governance designed for direct interaction with the legislative authorities. Decision-making hierarchy. It is critical for decision-making responsibility to be at the level where competence, accountability, and authority reside. Alignment with portfolio and organizational governance. 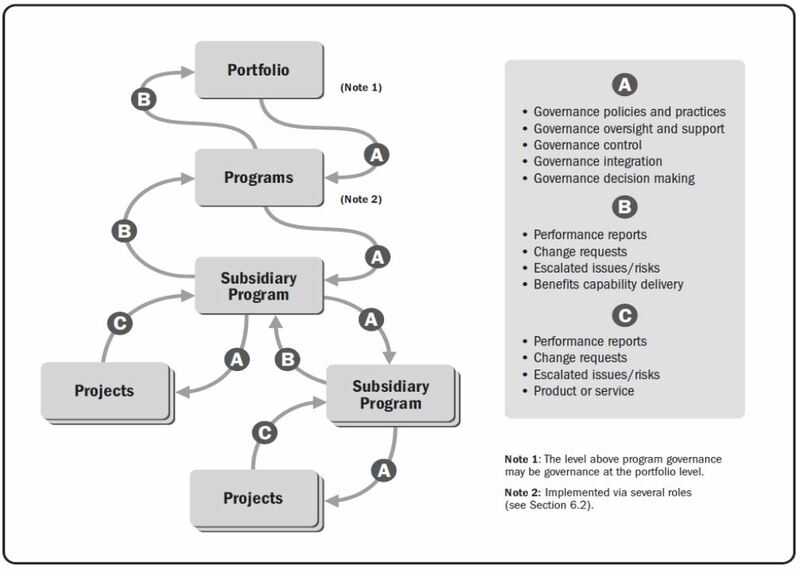 Program governance is impacted by the portfolio governance that it supports. Program delivery. A program that regularly delivers benefits to the organization is likely to require different governance than a program delivering all or most of the benefits at the end. Risk of failure . The greater the perceived risk of program failure, the greater the likelihood the governance team will monitor progress and success more diligently. Strategic importance. High-value programs critical to the success of the organization and delivering benefits that need to be completely aligned with the strategy may require different or more senior participants on the governance team. Program management office (PMO). In many project- or program-based organizations, a centralized PMO supports the governance of all programs for that organization. In other organizations, PMOs may be formed specifically for a given program. Program funding structure. When funding is secured from outside the delivery organization, for example from the World Bank, there are likely implications on the design of the governance and the skills required. The corresponding design of the governance should align with required practices in a timely manner. This entry was posted in Program Management and tagged PgMP by joapen. Bookmark the permalink.